The second day of the 6th Forum Brazil Africa started promoting an important conversation between Higino Marrule, Minister of Agriculture and Food Security of the Republic of Mozambique; Yemi Akinbamijo, Executive Director of the Forum for Agricultural Research in Africa (FARA); Daniel Balaban, Director of the Centre for Excellence against Hunger of the WFP; Livio Vanghetti, Vice President of Global Partnerships of Philip Morris International and Claus Reiner, IFAD’s National Director in Brazil. Yemi Akinbamijo stressed the importance of having a more attractive language in agriculture so that young people can understand it, strengthening the power of science and information in the area, and it is essential to focus on new researches. “Brazil has 200 million inhabitants, Nigeria as well. In Brazil, only 6% of the population is involved in agriculture. The African continent has 70% of its people working in the field. The question is this: agriculture is what Africa has. The demonstration of the power of technology is in Brazil, we need to combine these aspects and we will have a good scenario”. Daniel Balaban, Director of the Centre for Excellence against Hunger, drew attention to the importance of keeping people in the field. 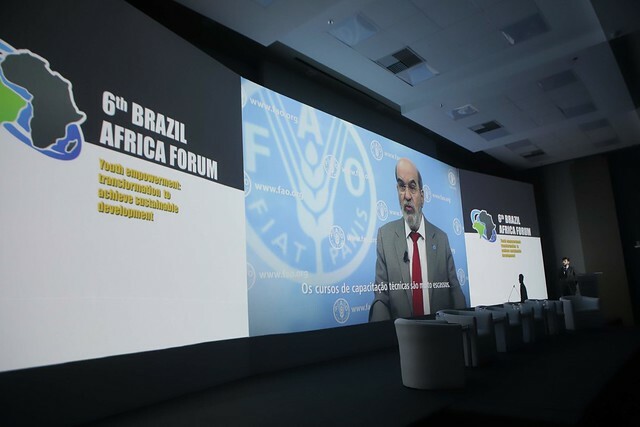 According to Balaban, when Brazil created the Zero Hunger program one of the pillars was investing in small farmers, fostering a demand structure. “My role is to support African countries so that they can create social policies based on school feeding. Food that goes to schools needs to come from family farmers”. The Director said that people in Africa have no interest in remaining in rural areas because of the lack of demand for the products produced. Through school feeding, we could balance the supply and demand equation. This will bring benefits to education, food security, health, and agriculture, as more food will be produced. Another point raised by Daniel Balaban was the UN Food Security Report, showing that 821 million human beings are hungry in the world. “Do not we have the technology to fight hunger in the world? What we need is the political commitment to do this. The world spends a trillion and a half on military issues and, to end hunger, we use only 1% of that expenditure. This is a shame. We should invest money in technology to support smallholder farmers and small producers, “he concluded. Claus Reiner, IFAD’s Country Director, pointed out that the empowerment of young people in agriculture is the future. The challenge is to make the lives of agriculture attractive to this youth, who long for new functions in the field, linked to technology. Claus Reiner said that young people want to create different forms of business and need some support through market access and business. “At this point, the role of the older generations, who can promote these opportunities, is crucial. We need to make room for the young people who are creating new ideas” he added.